Why work with Century 21 and the Goodale Miller Team? Here's 5 great reasons that we're the right choice for buying or selling your Oakville luxury home today! News: Snowbirds: Is Big Brother Watching You? An unfriendly, and unwelcome, message being sent out to snowbirds on both sides of the water may impact your choice to buy a home South of the Border. Think about it, you’ve spent your entire life dreaming of some warm little home 6 months out of the year - you worked hard, you did all the right things, but a small twist of fate might make it that more attractive to just stay in Canada. MoneySense magazine recently came out with it's Best Places list for 2014. Here's how Oakville ranked! Each March Festivals and Events Ontario makes their list of the Top 100 festivals and events in the province, and guess who just won one of the top spots? Bronte Creek’s Maple Syrup Festival! What many are touting as the next step in the right direction towards making Livable Oakville a reality, the new InZone zoning bylaws were approved by the Oakville Council in a unanimous vote. InZone incorporates new regulations and permissions outlined in Livable Oakville, the town’s official plan, setting the table for how, when, what and where buildings and updates can be constructed in Oakville. While many cities have children’s choirs, the Oakville Children’s Choir is in a class of its own. The Oakville Children’s Choir recently hosted an event to honour the Ontario Trillium Foundation’s gift to the OCC of $117,000. The grant will be used over the next two years to fund two different choir groups: A Few Good Men (male choir for ages 7 to 25) and Little Notes (a prep choir for ages 3-4). It’s expected that the grant will encourage mentoring, arts and culture in Oakville. MoneySense magazine’s latest city ratings just came out, and Oakville was chosen as No. 2 in the best mid-sized Canadian cities to live in. Not just in the GTA, or Southern Ontario, or the whole province, but all of Canada! It was second only to Burlington (which is a nice place to live - but we still think Oakville should have won! ), and beat out over 200 other cities for the top spot. Earlier in January the Oakville Town Council approved a new plan to revitalize Kerr Village - not only to improve the look and feel of the Village, but to provide both property owners and tenants with the funds they need to improve the façades of storefronts and buildings. A strange question, indeed - but according to a recent BMO survey over a third of Canadians (and almost half of shoppers in the GTA!) are more than willing to get into a bidding war if it means getting the right home. With so many people entering the process ready to fight tooth and nail, it can make the whole process a bit intimidating, right? Ford of Canada announced that its next generation car, the Ford Edge, will be built at its Oakville plant - made with tons of Hamilton steel. 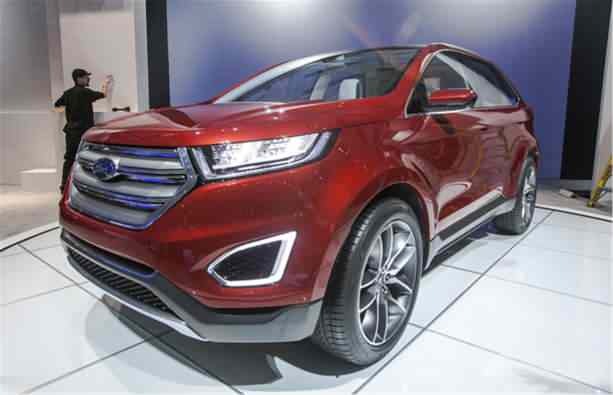 The new Ford Edge will be assembled at its local plant here in town, and sold all over the world in over 60 countries. This is great news for Oakville, especially since it will bring job security for years to come for over 2,800 autoworkers, plus Ford’s local suppliers.